Toenail fungus can be more than a painful problem. Fungal infection sufferers can experience acute embarrassment. They feel they aren’t able to wear sandals or remove their socks, even at home in front of loved ones. Dermatophytes are the cause of toenail fungus; they burry under the end of your nail and the skin beneath the nail. Infected nails may become thick, yellow or brown in color, deformed and may even begin to smell. The infection can spread to other toenails, the skin and even fingernails. Fungus is contagious and is commonly spread from one member of a family to another. You can also pick up toenail fungus in damp places: locker rooms, public pools, gym showers and nail salons. 15% of individuals age 40-60 are known to have the toenail fungal infection known as onychomycosis. Until recently, your only options for the treatment of toenail fungus were topical creams, oral medication that could lead to liver damage, or even surgery that destroyed the nail bed. At Eternal Youth Medical Spa, we offer a safe and pain-free toenail fungus treatment alternative: the Lumenis Lume One Nd YAG laser. Lasers have been used by doctors and specially trained laser technicians for years for the treatment of warts, dermal lesions and matrixectomy of ingrown nails. 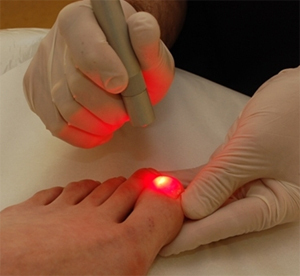 But now, lasers are being utilized for the treatment of unsightly and embarrassing toenail fungus. The Lumenis Lume One Nd YAG laser utilizes specific wavelengths of light that are able to kill the fungus under the toenail. There is little to no pain involved with the procedure and little to no damage to the nail. And the Lumenis Lume One Nd YAG laser is FDA approved! When you need relief from an embarrassing and even painful fungal infection, the skilled staff at Eternal Youth Medical Spa has the knowledge and tools to help. Our Albuquerque med spa can help you get those sandal-worthy feet back with our laser toenail fungus treatment. Contact us for an appointment today!